Expo-Scène is the leading entertainment event in Canada in the heart of Montréal! 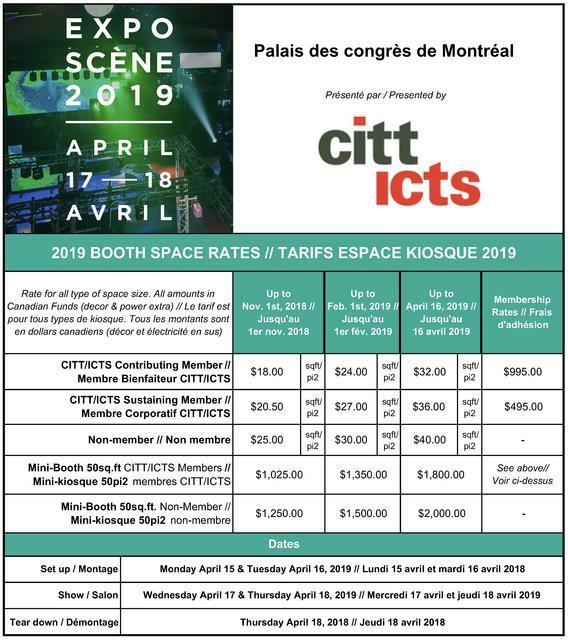 Wednesday April 17 from 10:00 a.m. to 5:00 p.m.
Thursday April 18 from 10:00 a.m. to 4:00 p.m.
Or more information or if you wish to exhibit at EXPO-SCÈNE, please contact us by email or by phone at 514 380-9147or 514 504-9998. 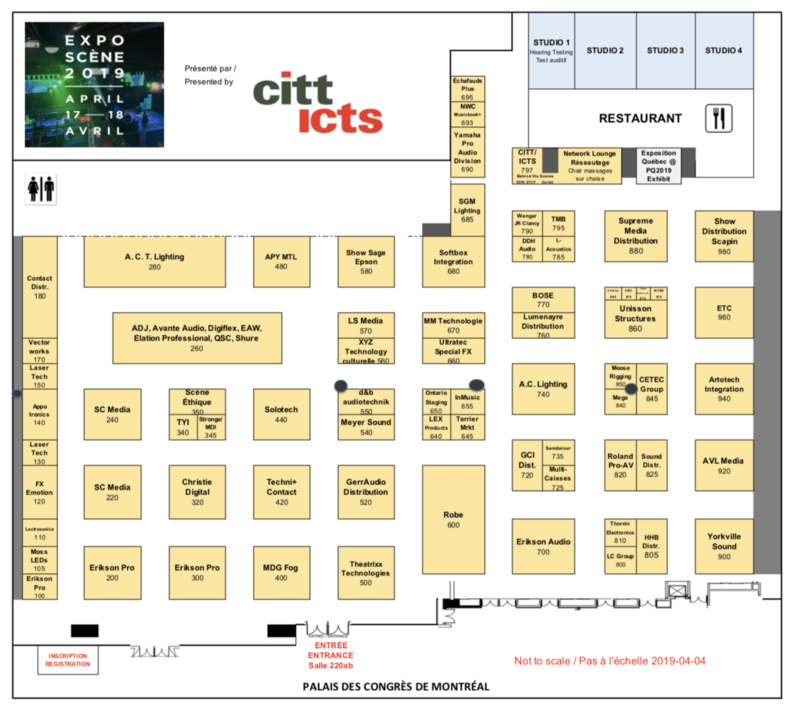 Overhead rigging for your booth must be ordered via the Palais des congrès. 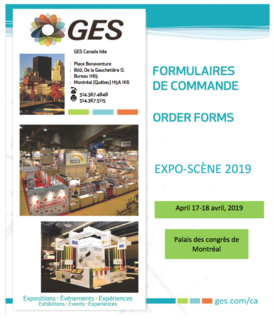 These services can be ordered on their on-line portal (select ‘April’ and then ‘EXPO-SCÈNE 2019’). The deadline for discounted price is April 6, 2019. Click here to download the GES exhibit kit with prices and order forms for decor, advanced shipment, advanced and showsite material handling. Please note that the exhibit hall is NOT carpeted. Please note that the exhibit hall general lighting will be dimmed at 33%. CITT/ICTS gives you the opportunity to rent a barcode scanner lead retriever for the duration of the show throughINSCRIPT, our official supplier. When renting a wireless, handheld scanning device, you will not only collect information about the visitors to your booth, but most importantly, you will be able to efficiently qualify them using your own qualifiers! All your booth staff should be registered. 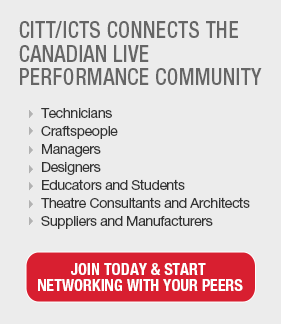 Please request your access code from us at exposcene@citt.org before registering your staff members. Once you have your code, you may click here to register. Tuesday, April 16th, from 3:00 p.m. to 5:00 p.m.
Wednesday, April 17th and Thursday, April 18th as of 8:00 a.m.